For camping, picnicking or just enjoying the Great Outdoors, consider packing some basic utensils. The Buck TravelMate Kit is one of those multi-use items that stores easily in your vehicle or on your person. Each kit comes with a wooden-handled knife with a five-inch serrated blade that can handle everything from buttering bread to chopping and dicing vegetables, to filleting fish, cutting through chicken and meat bones as well as other assorted tasks. 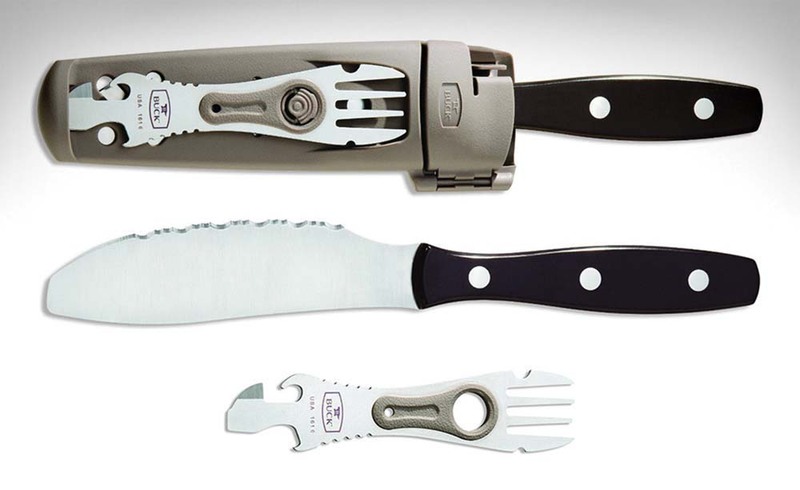 Also included is a detachable fork that also doubles as an opener for cans and bottles, a barbecue-grill scraper and flathead screwdriver. The Travelmate Kit stores in an antimicrobial (germ-suppressing/destroying) plastic sheath. Pick one up for $77 at www.buckknives.com.